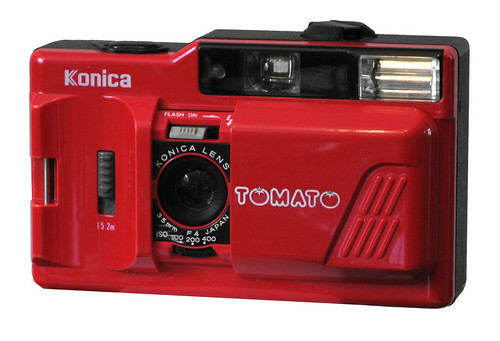 The Konica Tomato is a fixed focus 35mm film camera from Japanese manufacturer Konica, basically a red Pop-10. A switch on the front enables taking photos at a distance of 1,5 - 2 m. It uses shutter with a single speed of 1/125s. 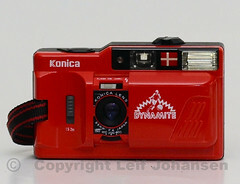 The Konica lens is a 35 mm f/4, that is protected by a sliding door covering when not in use. Three film speeds are supported including 100, 200, 400 ASA is three apertures. Film is advanced with a thumb wheel. A window is on the film back as a reminder of the current film type. Flash LN 10. 1.5V AA battery. This page was last edited on 11 November 2018, at 18:48.